Is your brain working properly? Are things in the world making too much sense? If you answered yes to these questions, and you desire that your brain be thrown into the washing machine, and then crushed with a hammer, then Causality ($1.99) is the game for you. 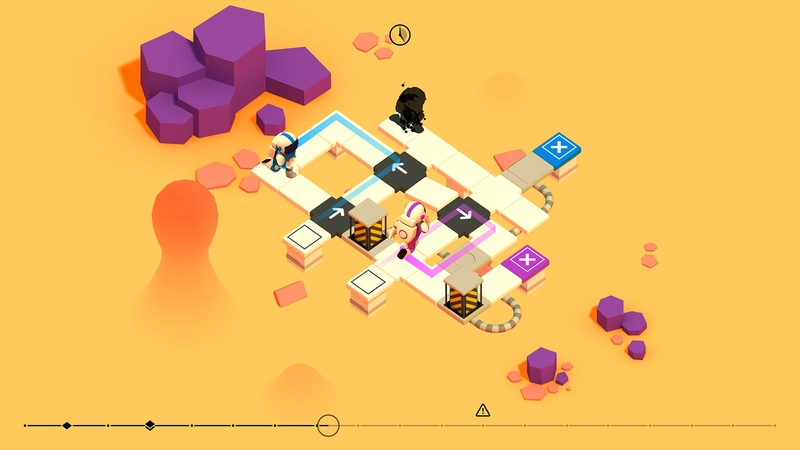 It’s a puzzle game for people who like their games to make sense…kinda, sorta. It’s a fun game, but one that will threaten your sense of perception and time. The basic goal of Causality is to get each astronaut from their starting point to the end point in one piece, with each square that they move taking up one turn. 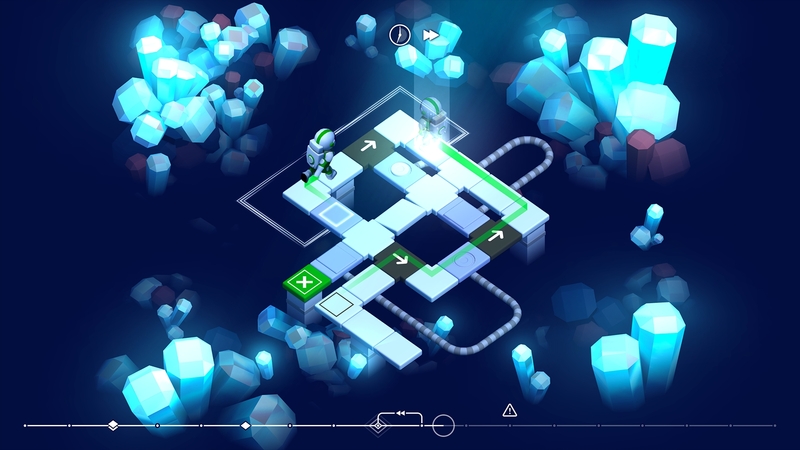 You can move all along the timeline of moves, where your method of navigating these astronauts is by swapping arrow tiles to send them in different directions. Where things start to get thrown into strange loops is when the time travel portal is introduced. An astronaut sent into this portal will travel back in time to a fixed point on the timeline, and this clone must be used to get to the goal. However, it can interact with even the original, so you have to figure out just what it is supposed to do and factor it into the entirety of your plan. Causality‘s time-travel portal element can be tough to understand even as you play it or try to watch it. So, on levels with a portal, they always will send the character that enters them back into the specific spot on the timeline. So, the ideal time to send a character into the portal is as late as possible, to get as many actions in as you can. Now, where things get screwy is that the time travel clone will appear at the point in the past where they are supposed to appear, and if you create the path that causes the clone to appear earlier in the timeline than where you currently are, the clone will show up in the spot that they are supposed to be. You will need to go back in the timeline to see how they’re properly traveling. Now, with a game that’s forward and backward as far as time moving, swiping vertically anywhere on screen to move back and forth through time seems initially like a silly control scheme. But it quickly proves to work quite well, allowing you to easily see how things will pan out in slow motion, one step at a time. If you want to jump to a specific spot on the timeline, you can do so by tapping on the bottom timeline bar. You will have to figure out a sensible way to move around the arrow tiles. In general, it’s best to lay them down right when your character is moving across them in order to keep everything in order. But, you might want to do some advance planning with portals so that you don’t wind up in situations where your clone pops up out of nowhere. It can be a bit awkward to play with. Also awkward is that you have to keep tapping to rotate the tile, where it would be handy if there was some way to instantly decide the direction it is. It’s just a mildly annoying bit of tedium. There are basically 40 levels that you have to solve in order to complete Causality, but each of the 4 worlds has 5 additional levels that are meant to challenge you to an extra degree. Yes, that’s right: if the core levels aren’t difficult enough for you, there are even harder ones to play. Anybody who completes all 60 levels might get their third eye opened. Even if you just beat the normal levels in this game, that’s a noteworthy accomplishment. 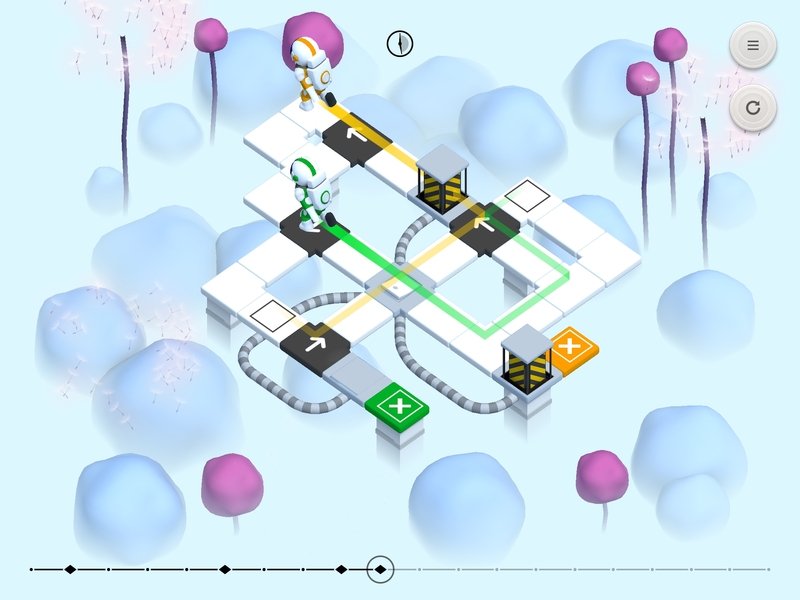 Causality sets out to break your brain with its time travel logic. Having to control two different astronauts – possibly even three or four depending on the level – is tricky, in particular with how you have to deal with the time travel logic as well. Arrow puzzles are simple enough, throwing in temporal physics makes for another challenge! The rules are tough to latch on to, but they make sense…kind of. It’s certainly rewarding when you solve a puzzle, because the game is asking a lot of your puny meat-brain to try and solve some of these puzzles that are put forth for you. Causality looks quite stunning. There’s backgrounds that change as time moves in the puzzle. Little visual flourishes accompany the portal, switches, and arrows in the game. Animations are smooth, especially when controlling time yourself, and you can see your astronauts run slowly as you move time along. The soundtrack provides an ethereal atmosphere that fits the experience well. This isn’t exactly a relaxing puzzler, this is more of a test of your skill and thought processes. It’s not for everyone; if you’re into being mentally tested to your limit to solve some puzzles with unique rule sets, this game is perfect for you. Causality is absolutely brilliant. But, because it’s difficult with its own rules, solutions can feel arcane and tough to come by, too. And thinking when time isn’t linear can be tricky, too! Causality is a fantastic game, one I’ve enjoyed my time with, even if it has left my brain a gooey mush. If you have the patience and the knack for time-bending puzzles, check it out. Even if it doesn’t sound like it’s up your alley, do consider it, at least!